The town of Arkham, Massachusetts is in a panic. Horrific and bizarre events have begun to occur with increasing frequency all seeming to point towards some cataclysmic event in the near future that may spell disaster for everyone. Only one small band of investigators can save Arkham from the Great Old Ones and utter destruction! 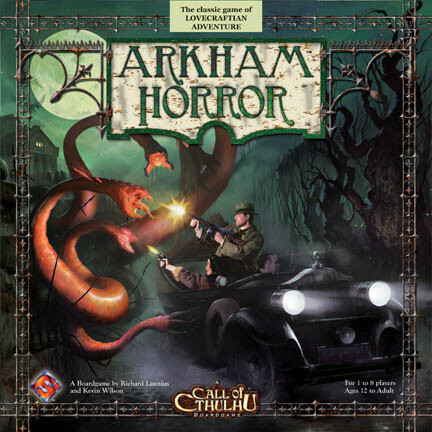 Originally published by Chaosium, Inc. almost two decades ago, this new, updated edition of Arkham Horror features stunning new artwork, as well as revised and expanded rules from the games original creator, Richard Launius! Arkham Horror is a cooperative game for 1-8 players, ages 12 and up.